The class leader has had a customer-focused update for 2017, explains Alex Grant. Nissan has had such a successful ten years with the Qashqai, that it’s almost hard to imagine the forgettable Almera and Primera filling this car’s role. Practical and fashionable, it holds a more than 10% share of the crossover segment it redefined in Europe, and remains the benchmark product despite a vast choice of alternatives. A lot of that came down to making SUV styling, traditionally something which also carried SUV running costs, much more palatable. Nissan took the lead in this segment in 2014, achieving 99g/km CO2 emissions without hybrid technology on board, and only its sister car, the Renault Kadjar, has matched it since. Which means, in fleet, it still has an advantage over its rivals. Nissan hasn’t managed to reduce fuel consumption further this time, but it has made this engine’s key selling point more accessible. The styling updates that mark out refreshed versions also contribute improved high-speed refinement, and the aerodynamic new 19-inch wheels mean there’s no CO2 penalty for moving up to high-spec versions. Even in luxurious Tekna+ spec, with its watchstrap-like three-dimensional nappa leather, it still comes in at 99g/km, unlike the Kadjar. 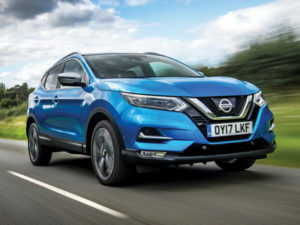 It’s a widely used engine and suits the Qashqai well, with plenty of low-rev pulling power and respectable real-world economy, based on the performance of the outgoing version. Extra sound deadening, thicker glass and better isolation of the engine bay mean it’s also significantly quieter too – not that its predecessor was overly gravelly. Factor in car-like handling, firm but comfortable ride quality and plenty of space, and it’s a great all-round offer. So, while familiarity can be a mixed blessing now there are plenty of reasons to go elsewhere, this subtle update adds up to more than the sum of its parts. The segment-defining Qashqai faces tough competition, but it’s still the car to beat.